Note: Certain models may have limited or no compatibility. When in doubt, please reference the Libec website for an updated list of cameras that have been tested. Box Dimensions (LxWxH) 5.3 x 3.9 x 3.2"
Remote Zoom and Focus Control for Select LANC and Panasonic Cameras is rated 4.3 out of 5 by 39. Rated 5 out of 5 by Star Path Images from A Must have for long shoots The zoom controller is extremely well made and performs flawlessly with a Canon XF100 for both zoom and focus. The rocker controller is comfortable and you can control both focus and zoom at the same time with a bit of practice. It greatly reduces arm strain on long shoots and keeps you from bumping the camera from reaching for the rocker switch which can distort the image and sound. The only addition I would like to see is at least one more setting for zoom speed, but most cameras have variable speed in their menus. This controller brings my camera up to what a more high priced camera would offer, but at an affordable price. Highly recommended. Rated 4 out of 5 by Sig from Works great with Sony A/V-R I have a Sony HDR-CX760V video camera which has an A/V R port. I wanted a zoom control that had a variable speed zoom (the more you press it the faster it zooms). The ZFC-5HD performs this function very well. It also has a switch that limits the maximum zoom speed. The contol performs On/Off, Rec/Stanby, Zoom In/Out and Focus. It does not have a button to toggle between auto/manual focus (you need to select that on the camera). 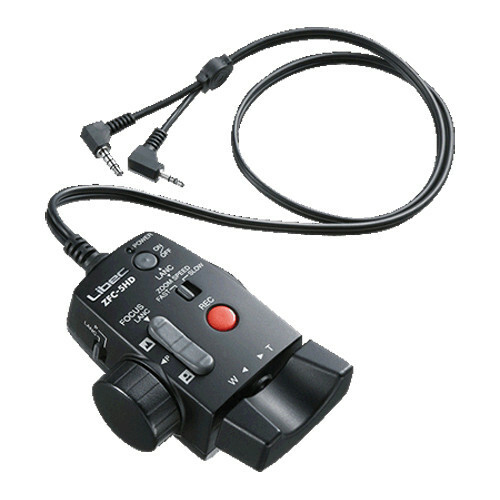 To use this LANC control with the Sony A/V-R port you need an adapter cable such as the Libec A-3AV. I previously pruchased the VariZoom VZ-Rock controller and it would not function with the Sony HDR-CX760V. Rated 3 out of 5 by Joe from Zoom & Focus Control with AG-AC160A Ordering, shipping and delivery was excellent with B&H (as always). The zoom and focus control sort of worked with our Panasonic AG-AC160A. The zoomed worked great, control was nice and there was a good feel overall to the controls. The downside, we could not get the focus control to work. I couldn't find anything saying it was or was not compatible with the AG-AC-160A. The directions included with the remote basically said check your camera's manual. Checking the web as well I was not able to find any more information. Long story short, we decided to return this unit and get just the remote zoom control which in our case is probably the better option for our setup. Rated 5 out of 5 by Filmgekko from Great for my church, and iMag I purchased 3 of these units for my church video system which uses Prosumer camcorders on PTZ mounts on the walls of our worship center. The distances range from 30-100 feet from the control booth. Using 100 foot Lan-C cables these units work great. The biggest seller for us was the on/off button. Previously we had to manually turn on and off all three camcorders, which was a hassle to say the least. Now we can turn on all three camcorders in a matter of seconds from the control booth. Additionally the ability to switch between Panasonic and Lan-C is great for me, as I use a Panasonic AC-90 for my video business. Recently I was working on a video at the church with my own gear (instead of taking one of the mounted cams off the wall), I grabbed this controller and plugged it into my AC-90, it worked like a charm. I have worked in iMag (Image Magnification/live video on a projector at events) for 8 years now working with different iMag companies, and I have used several different controllers. This one can hold its own with higher priced products (Though it does have a 'plastic' feel, not a 'metal' feel like the more expensive ones do, but this does not bother me at all). It works worlds better than some much lower priced ones I have used. I think this is the best value for the money without sacrificing usability and features. I plan to purchase one for my own use very soon, and mount it to my shoulder mount next time I shoot an MMA event. It's going to save a ton of hassle!One side note, for those using it for installation like we are at my church. These units will not sit flat. They have a small column/tube on the back that is used to screw the bracket onto a tripod arm. We actually have a metal platform on the desk that the switcher sits on, with the power regulator beneath. This platform has circular holes in it, which fit perfectly to place this tube into and screw the back in underneath, securing them in place quite well. However it's something to consider if you want to use them in the same manner we do.Overall a great product, and I haven't seen its equal for the price. Rated 5 out of 5 by Johannes F van Graan from Durable, reliable and easy to work with As a leading force in performing engineering forensic inspections, product evaluation and specialized training our equipment is often deployed under really harsh conditions. We mainly use Canon professional video cameras with LANC connections. We find the Libec equipment (both zoom control and the zoom and focus control combination units) not only to be excellent value for money but also capable to withstand harsh working conditions. What makes this zoom and focus control unit unique is the ease with which it can be attached to a SteadiCam arm. Rated 4 out of 5 by Bobkat from Not Bad! I'm a professional Freelance Videographer (27 years experience). I bought this unit to use on my DVX200. I do training videos, conferences, Corporate projects and this zoom control works quite nice. When the camera is on stix, trying to zoom smoothly is sometimes a challenge but with this zoom control, the shots come out nice. Nice product, price is right. Libec ZFC-5HD has a slide switch on the top the Rec (red) button. In mine it does not slide. Wondering if it is just mine or it is designed like that, which I doubt ? Do you have a ZFC-5HD or another Libec? The other Libecs do not have any slide switches. Or if you have a ZFC-5HD and it does not have the slide switch it is probably an older model. Will this work on a Panasonic AG-AC8PJ? Sorry but there is no remote control connection on the AG-AC8PJ therefore no remote is available for it. Is this product works with Sony ex1? Thank you. Unfortunately not, the Sony EX-1/EX1R require an 8-pin connector. Instead, please consider Libec ZC-9EX designed for Sony EX cameras. &lt;a href= http://www.libecsales.com/products/remote_controls/ZC-9EX.html target= _blank &gt;http://www.libecsales.com/products/remote_controls/ZC-9EX.html&lt;/a&gt;Note. ZC-9EX has zoom control capabilities, no focus control. Thanks. Will this controller work with Sony A7r2? HiNot even the Sony website states a LANC input on this camera, so no, It wont work. does this work with the pmw200 sony cam? will this work seamlessly with Blackmagic Design Studio Camera 4K with Panasonic 35mm-100mm f/2.8 Lumix G Vario lens? Thanks! The mini jack on the Sony will allow one of the two connections from the ZFC-5HD to be connected providing partial function. My Panasonic DVX-200 has only one connection which allows the Zoom function to work. Manual focus isn't available - Not ideal but ergonomically better than the built in zoom options for me. Does the knob on the left vary zoom-speed? How many levels are there? Will it comply with or override the zoom speed you set on your camcorder itself? Thank you! Would not recommend this Controller. Unit was replace in less than a year and have had problems as well with replacement unit.